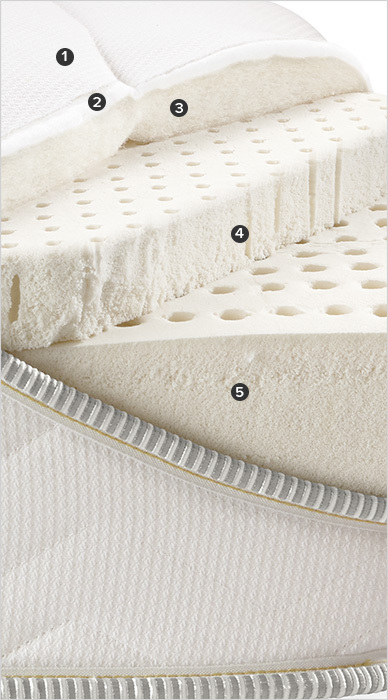 Our private-label, American-made Natural Latex Foam mattress features safe, all natural materials, including organic cotton, pure wool and organic latex with no synthetic fillers. Natural latex conforms to your body to alleviate pressure points and localizes movement for undisturbed sleep. Plus, the natural properties of latex and wool make this mattress naturally anti-microbial and anti-allergenic and a great solution for those with allergies or chemical sensitivities. Unlike our other mattresses, this flippable design has a softer side and firmer side for two comfort options in one mattress. The low-profile design of our mattresses is a perfect fit for our modern platform beds, which have support slats that eliminate the need for a box spring.